Ashwood is a detached home within 3 acres of gardens alongside the old railway line. A private gravelled driveway leads up to the rear of the house with ample car parking and a garage. From the front door there is a reception hall leading to a bright south facing sitting room and separate dining room. The dining kitchen has ample space leading to a good sized utility room. 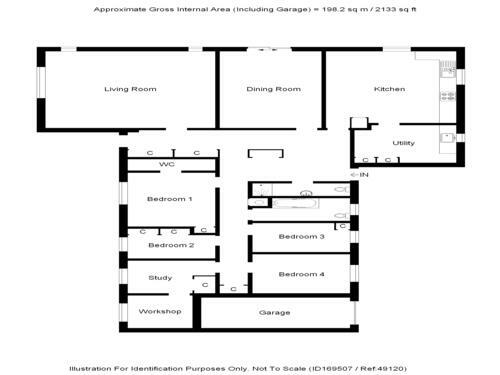 The main hall leads to four bedrooms, bathroom, shower room and study/bedroom 5. Outside is a mix of formal gardens and woodlands leading to the west. To the east the old railway line route leads to a stone railway bridge. From St Andrews head south on the A917 towards Crail. Continue past the turning to Boarhills and at the next left bend turn right into Station Road. Follow the gravelled road and turn right into Ashwood. For route planning the post code is KY16 8PR. Less than 4 miles to the north lies St Andrews known as the home of golf and the oldest university in Scotland. The town has a wealth of facilities including a theatre, cinema, excellent shopping, harbour and leisure centre. The nearest primary school is just to the south of Kingsbarns and there is an excellent state school at Madras and private education at St Leonards in St Andrews. Leuchars railway station is around 8 miles distant with fast links to Dundee and Edinburgh. The airport at Edinburgh can be reached in an hour and Dundee airport is nearby with flights to London.